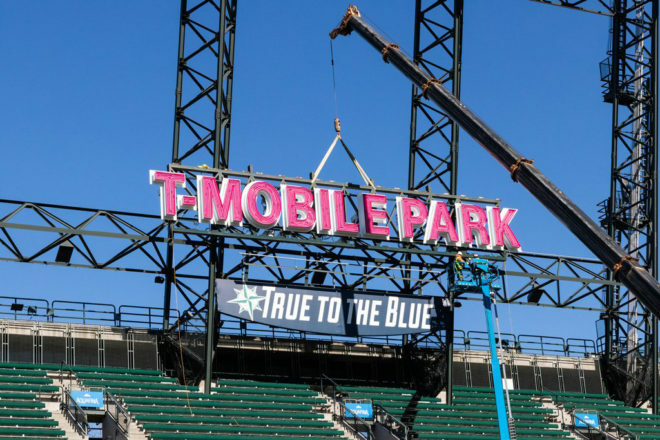 With days to go before MLB’s Opening Day for the 2019 season, more details on T-Mobile Park and the improvements T-Mo has made to it have come out. T-Mobile customers can look forward to improved coverage when attending a Mariners game at T-Mobile Park. Capacity in and around T-Mobile Park has been increased by three times, T-Mo confirmed to GeekWire. If you need to recharge your phone after a bunch of sharing and photo snapping, you should look for a magenta-colored steel support beam, which will offer 32 outlets for mobile device charging. Another benefit that T-Mo customers can look forward to at T-Mobile Park is a fast track entry. A special T-Mobile Customer Entrance can be found on the left field side of the stadium, letting subscribers get into the ballpark more quickly by showing the attendant their phone. This fast track entry will be good for any event at the park. Once you’re inside that gate, you’ll be able to visit The ‘Pen, which T-Mo has said let you watch the Mariners during batting practice and pitcher warm-ups when it opens 30 minutes early. There will be surprise giveaways and a live DJ on select days, too, and T-Mobile has concocted a new cocktail called the Magenta Mojo that’ll sell for $12.50. T-Mobile previously confirmed that it’ll be bringing T-Mobile Tuesdays to Mariners games as well. At Tuesday home games, T-Mobile will give customers surprise seat upgrades and free stuff. Overall it looks like T-Mobile customers will have a lot of perks to look forward to when attending Mariners games this season. One of the most exciting is the increased capacity, which should help ensure that you can share photos and videos while you’re enjoying a game. When it announced the new T-Mobile Park name last year, T-Mobile confirmed that the naming rights deal will last through December 2043. Reports have suggested that the deal has an annual value of $3.7 million, which means the 25-year deal is worth $87.5 million. Are you planning to attend a Mariners game at T-Mobile Park this coming season? Hope they do the same for Cleveland by July for the 2019 ASG. I don’t like baseball.. at all. But TMobile just might intice me to a home game here in my state because the perks will keep me looking at my phone and give me something to do during the game! That’d be an expensive 4+ hours of my time, but it’s TMobile hype right? Plus TMobile gives me a subscription to all these games anyway FOR FREE so I should totally go instead of watching at home. It seems like TMobile spent upwards of $87M in the wrong place. IMO they will never make that money back from this deal. And what exactly is your opinion based on? I’m sure T-Mobile has people a lot smarter than you and surely more knowledgeable on the subject making these decisions. If they can’t make $87.5M back on this deal over 25 years, they’re definitely doing something wrong. Stock prices and Legere’s previous track record. Try insulting my intelligence again. No it doesn’t, the truth enlightens. Glad you feel enlightened today sir. Pretending to be an expert on subjects you’re unfamiliar with has done more to insult your intelligence than anything another person has stated. Then try telling me what happened to the last company John Legere was CEO of. Also, what happened to the owners and team stock after every Mariners Stadium buyout since the Kingdome? For those thinking this is a bad deal, the cost of a single billboard in Seattle for at 12 months x 25 years is around $2 million. Those are regular streetside ones, the main sign for the stadium is visible for several miles, including the millions of cars that sit in traffic in view of it on I-5. The sheer number of mentions and static ads is probably worth at least half of what they paid. Thank you T-Mo, I’ll be there on opening day. I wonder if the fast track entry works for your entire party as long as one person can show a T-Mo phone? Hey, maybe they can finally fix signal strength in Columbia City with all these customers on the train to games.